Since the trailer of the upcoming teleserye of LizQuen was released, it got various reactions from fans and casual viewers alike. While the fans of the popular love team are excited for their idols’ comeback on primetime, there are also some who express their disappointments on the casting of the show which is inspired from pre-colonial Philippines. Liza and Enrique both have foreign descents; Soberano’s mom is American while Gil is part German and Spanish. Other stars include Matteo Guidicelli, Sofia Andres, and Makisig Morales. 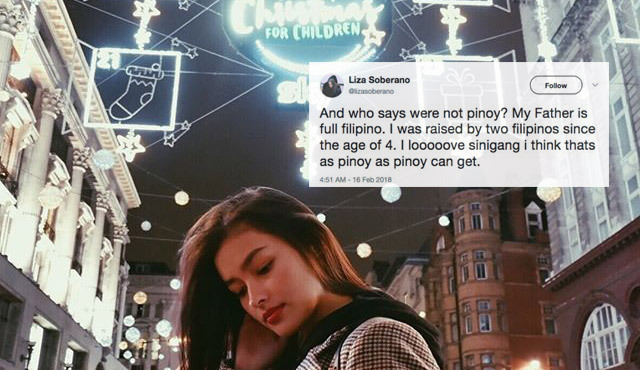 When the issue spread like wildfire, the kapamilya actress took on her twitter account to defend her nationality by tweeting that her dad is full Filipino and she was raised by 2 filipinos since the age of 4. Liza also reiterates that she loves sinigang and that as pinoy as pinoy can get. With her response, some replied that she missed the point of the controversy while others defended Soberano. With the fiasco about the upcoming kapamilya fantaserye is ongoing, Mark Angos, who is the headwriter of Star Creatives (Forevermore, Dolce Amore), also spoke up on his social media account about the allegations of colorism issue. He tweeted that Bagani is set on a fictional world called “Sansinukob” where it is a place that has elements of Filipino mythology. Angos also clarified that the series is not pre-colonial or historical hence, it is just a portrayal of ancients and historical events. Bagani is set in a fictional world called Sansinukob- isang alternatibong mundo na may mga elemento ng mitolohiyang Pilipino. It is not PRECOLONIAL. It is not HISTORICAL. Hence it is not a portrayal of sinaunang tao or a particular historical period or event. When commenter’s Caroline and May asked the head writer on why the casts were force to make their skin darker, he explained that the desert people were colored brown because the sand sticks on their skin. Despite the debates and mixed opinions, Angos said that the silver lining about it is that everyone is talking about the etymology of “Bagani”. It is set to premiere on March 5 replacing La Luna Sangre after Ang Probinsyano on ABS-CBN’s Primetime Bida.